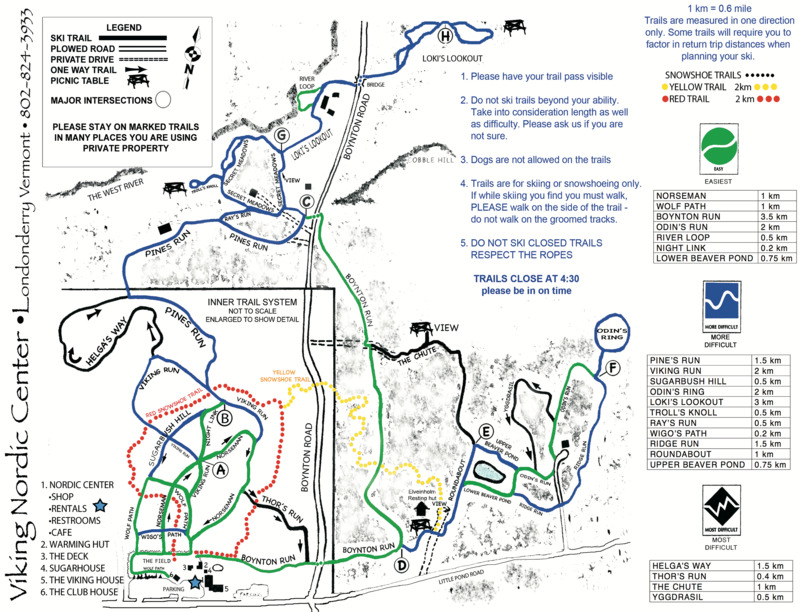 Trail Map & Descriptions - Where skiing is rewarded ... with cookies! Our Trails are the Difference! Viking Nordic boasts 34 kilometers of pristine cross-country ski trails and an additional 4 km of snowshoe only trails. All our trails are open to snowshoers we only ask that when we have tracks set, that you do not walk over the tracks. Our meticulously groomed trails wind and roll through acres of thick woods, past beaver ponds, and across open meadows. From the novice to the seasoned cross-country expert, our trails offer something for everyone. Click on the map below to see a full size printable version. A very short loop through the woods with a wide, easy hill with a great run out. Learn to control your snowplow on Wigo's hill. 3 acre meadow with slight grade. Practice tracks and a long loop around the outer edge of make this a great place for new skiers to start. Part of the Night Skiing trails. The flattest trail, great beginners trail connecting with the upper part of The Field to make a good learning loop for skate or classic skiing. Connects Sugarbush and Norseman. Main connector on the night skiing trails. Take Wolf Path to find the start of Viking. Trail climbs to top of Sugarbush hill then drops around the back of the hill. One fun pitch leads to a long gradual run out. Steep, winding, and fast. Great way to get a thrill without a roller coaster. One way down hill. Starts off of Norseman trail. Take Viking Run to get to the trail head. Trail is a long winding downhill ending with a short gradual climb up to meet Pine's Run. One way and fun for experienced skiers! Connects Boynton run and Thor's run. Goat's path is one of the original center trails. This trail was cut in 1970 and has not changed much since it first opened. Winding through the woods with a short steep section. It is a "back country" trail for enthusiasts of old style ski trails. We don't groom this trail, we only pack it, occasionally. Great long gradual downhill, runs through old White Pine forest. Very distinct area of the woods. Travels through an overgrown meadow and a red pine plantation. Fun trail, little ups and downs and quick turns. Trail runs into old farm meadows along the West River. Great wildlife habitat, the owl can be seen here on occasion. Great destination ski -- take a lunch and enjoy the views. Best view of the West River Valley from the first hill at the farm. This is a long out and back ski and climbs subtly on the way back. Over the billy goat's bridge and up the hill to a hidden picnic table with views of the West River below. Out and back trail not for beginners. Short downhill run from Pines Run to Secret Meadows trail. Pretty trail, that crossed a lovely old stone farm bridge which is visible in the spring. Look for deer tracks and other animal tracks near the stream. Loops off of Loki's around the edge of one of the old farm fields and follows the river for a bit. Some skiers have spotted otters playing on the other side of the river. Best long loop without getting too far out. Head out on Pines Run then connect to Boynton and follow it back to the center. Gently rolls through old hardwood forest. Loops off of Boyton at either end, each climb in elevation is rewarded with a nice downhill run. Climbs more than lower Beaver Pond, route takes you to Odin's, Ridge Run, Ygdrasil. Good thrilling trail, fun rolling hills through scenic pine forest. Old logging roads, quick turns and dips. Not a good skate trail. A long and exciting downhill from Roundabout to Boynton Run. It twists and turns through hemlock forests. Expert skiing only. Connects from Roundabout to Boynton, fast way back. The ring is a nice loop trail on an old farm road. Ski it counterclockwise. Little ups and downs, a peaceful trail farthest out on the outer trail system. If you were going to see evidence of moose it would be out here.